We cannot show each custom leather product with all badges. The badges shown in the pictures are for example only. These are produced with the recessed cut for the badge you order or indicate. Click on the product picture to view larger size. This dress leather notepad style wallet is an excellent choice. 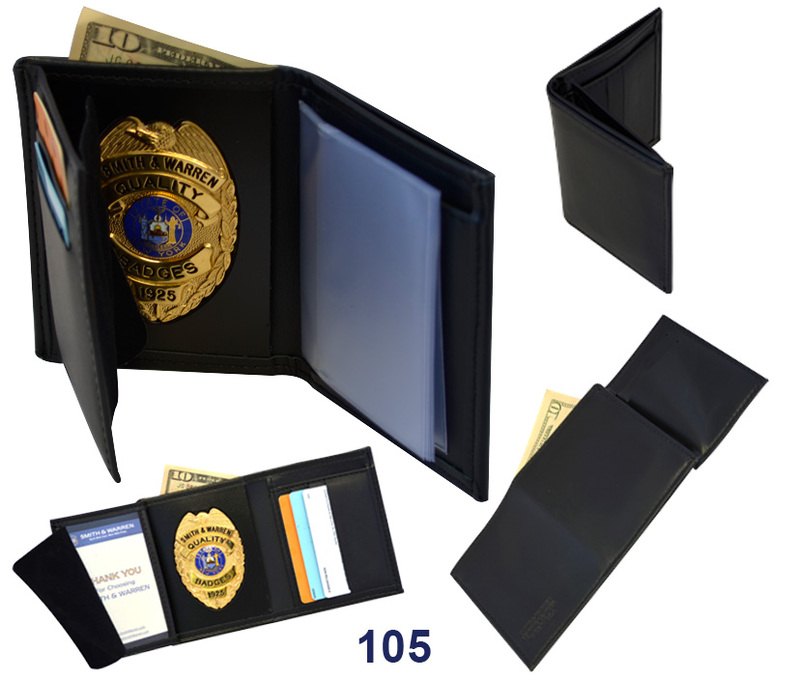 Badge in this bifold wallet is concealed. 6 credit card slots as well as a flipping ID window are included. There is plenty of space in this wallet to store currency, badge, ID and credit cards. The wallet is supplied with a picture sleeve. This wallet is made from top grain leather with turned and stitched corners for a high quality finish. The billfold compartment is bi-fold. 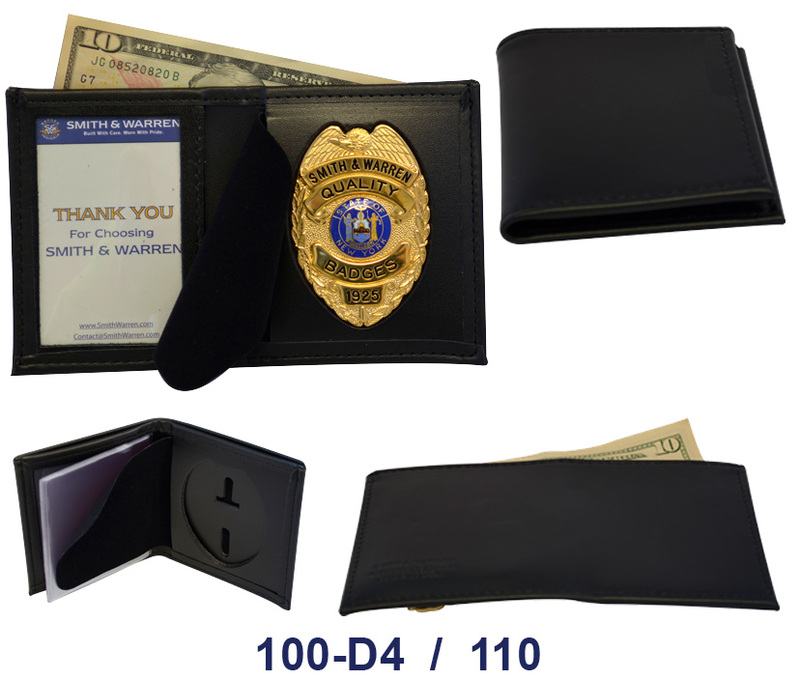 The badge and 3 credit card slots are separated with a high quality protective felt. The plastic picture sleeve is included. 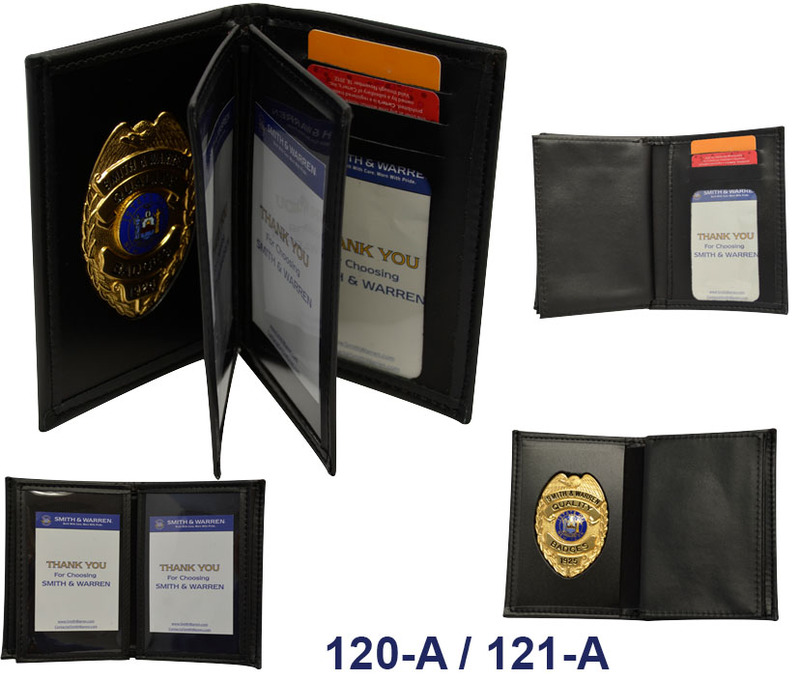 Badge Width - 2 7/8"
This dress leather wallet is made from top grain leather with turned and stitched corners for a high quality finish. Badge is well concealed on the right, ID compartment on the left with a protective felt permanently attached in the center. This wallet is supplied with a picture sleeve and it does not hold credit cards. 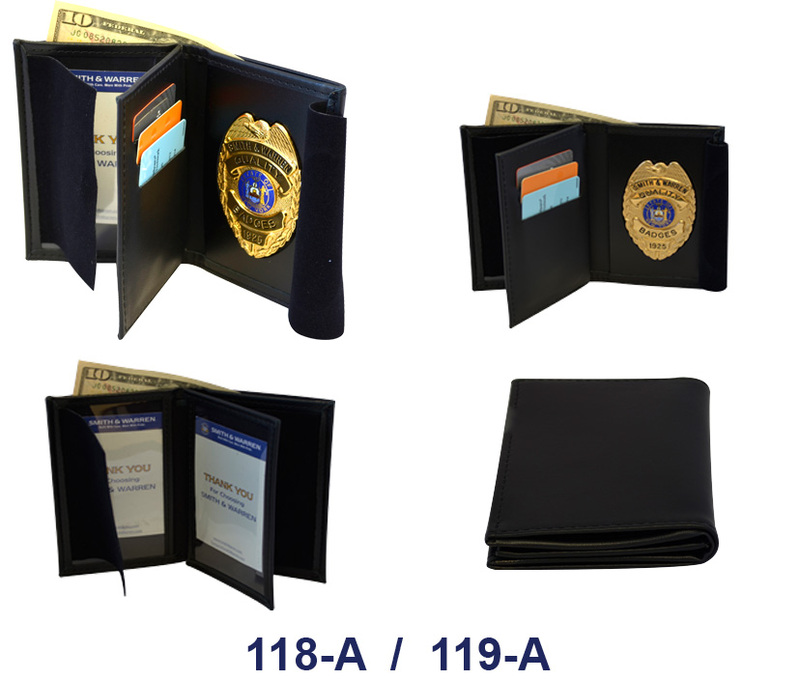 This billfold-style wallet includes an 8-photo sleeve in the center, that closes with a snap to keep your photos private. The badge is covered with a felt flap to protect it. This model has a money pocket in the design. 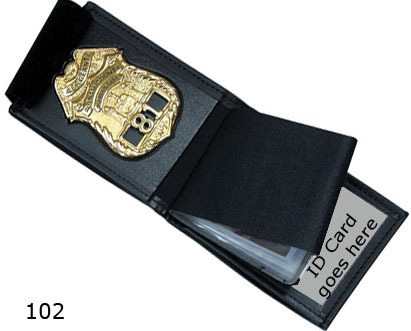 Designed with a flip out badge section which allows you to show your badge without having to expose the ID/credential. It also includes 3 credit card slots. This dress leather book style wallet is an excellent choice. 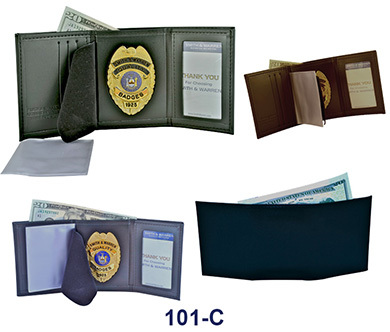 Badge is concealed well and the wallet includes 5 credit card slots and flipping ID window. There is plenty of space in this wallet to store currency, badge, ID and credit cards. The wallet is supplied with a picture sleeve. 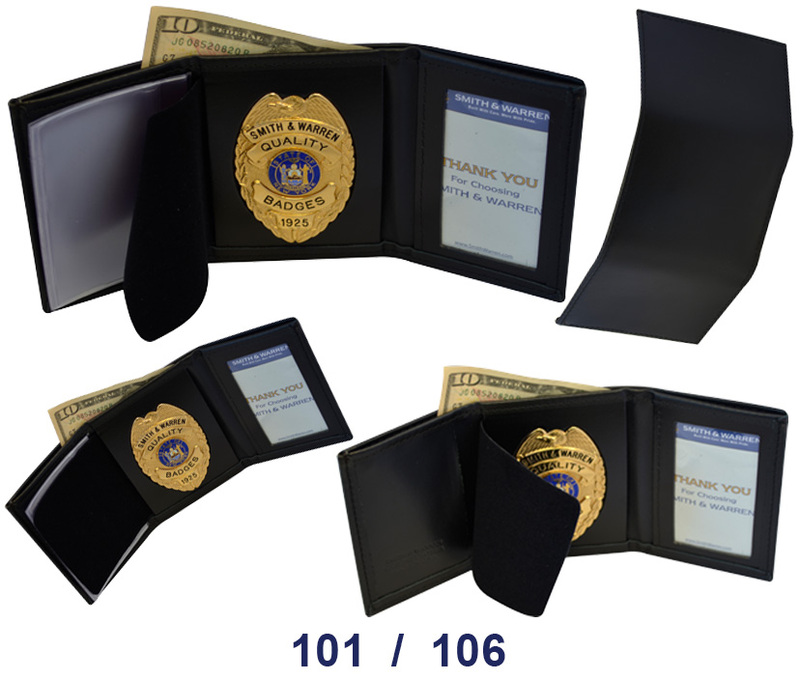 Hidden badge wallet w/ money pocket, 5 cc slots & flipping ID window. This dress leather wallet is our best seller. 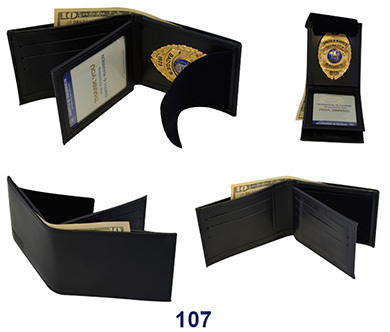 Bill-fold section is bi-fold, but the flip out section allows for more storage for credit cards. Badge is well concealed in center section of the case and can be exposed exactly when you want it to be. This wallet has 5 credit card slots and is supplied with a picture sleeve. This dress leather wallet is made from top grain leather with turned and stitched corners for a high quality finish. The bill-fold section is tri-fold. 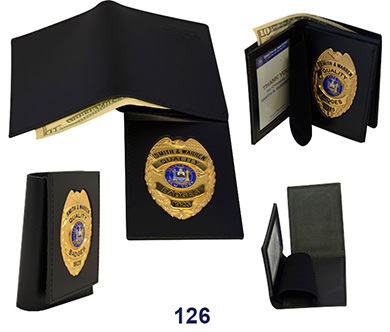 Badge is well concealed in the center section of the case and can be exposed as needed. This wallet is supplied with a picture sleeve and it does not hold credit cards. 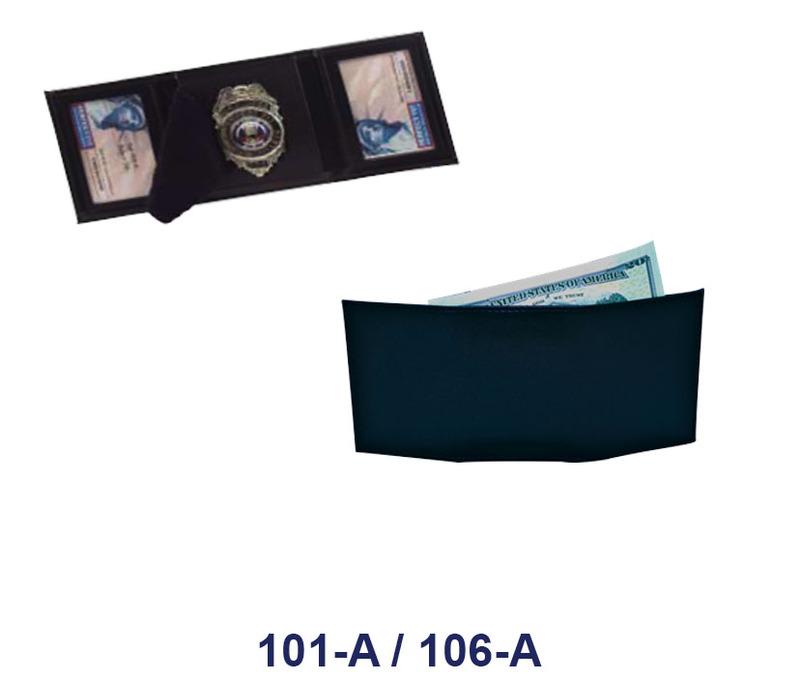 The bill-fold section in this dress leather wallet is tri-fold and the ID compartment is permanently attached on the right side. Badge is well concealed in the center and can be exposed as needed. To the left of the badge you can store up to 3 credit cards. This wallet is supplied with a picture sleeve. This dress leather wallet is made from top grain leather with turned and stitched corners for a high quality finish. The design includes a money pocket. . Badge is well concealed in the center section of the case and can be exposed as needed. This wallet is supplied with a picture sleeve and it does not hold credit cards. 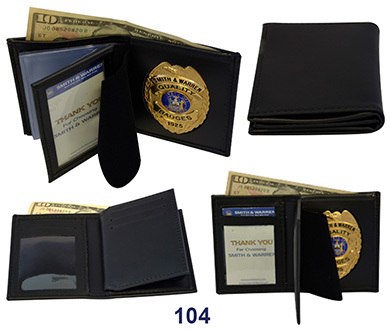 Made from top grain leather with turned and stiched corners for a high quality finish, this "federal" style wallet fits credentials of any size. 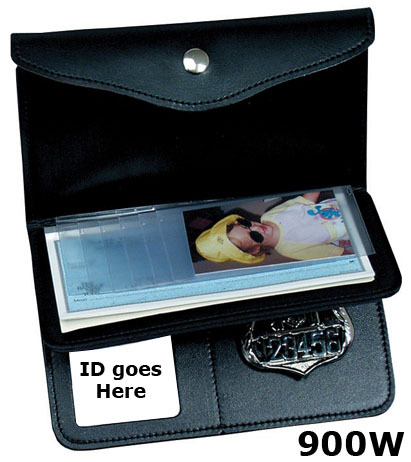 Some of its prominent features are two separate flipping ID sections, 3 credit card compartments, the badge safely concealed on the left and plastic picture sleeve. The money compartment is bi-fold. There is nothing this wallet will not hold. 120-A - Double ID Badge WalletBadge with Double ID and Credit Card Wallet.